A real surfers surf shop, a great board selection and all the basics you need to hit the pier and start shredding. A Beach Street Favorite. We have three boards in our quiver from this shop. No other brand even has two. The board in the picture is in the studio for KühlToys and Scott uses it regularly to surf his favorite spots. One trick we use is versa surf traction. 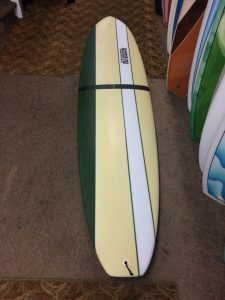 We are testing another one in Hawaii that is a low profile stamped silicone that is a bit stickier than Versa Surf, but for now, this board from Rockin Fig is Scott’s favorite board. We think that is why he brings it into the studio. We hear he doesn’t like to share. As you can barely see in the photo, Rockin Fig has a pretty sweet selection of styles from 5′ shredders to 10′ cruisers with all kinds of great art. We got this picture from Kelly, from the day that Scott bought his first Fig. Maybe someday they’ll get the guys at Firerockweb.com to fix it. Previous Topic: Is BMW Testing a B Class Killer?